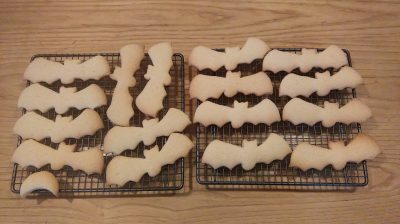 This recipe makes about 16 x 15cm long bat shaped biscuits, double it for a larger class or use smaller bat cookie cutters. 2. Ensure surfaces are wiped clean, hands are washed and hair tied back. 3. Measure out your ingredients. 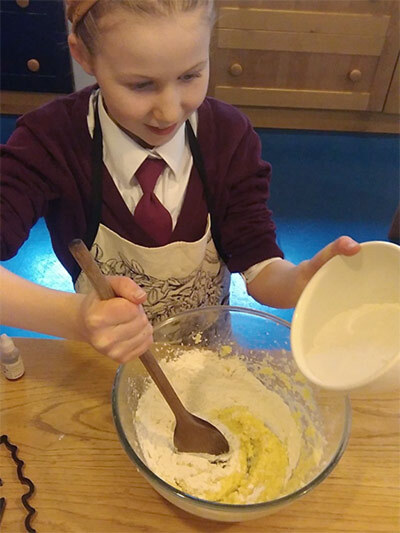 Add the butter and sugar to the mixing bowl. 4. Whisk together until the mixture is creamy and fluffy. 5. Then mix in the egg (and vanilla if using). 6. Then add the flour and baking powder. 7. 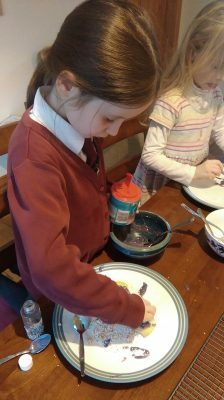 Keep mixing: it may be easiest to use a wooden spoon at this stage. 8. When you have it all well mixed see how sticky it is. If it is too sticky to roll, add a little flour to make it more manageable. Be careful not to add too much extra or the dough will be tough. 9. If you have time, rest the dough, covered in clingfilm, in the fridge for an hour or so. 10. When ready to bake dust your hands with flour and place the dough onto a floured counter or table. Sprinkle with flour and roll it out to a thickness of about ½ cm. 11. 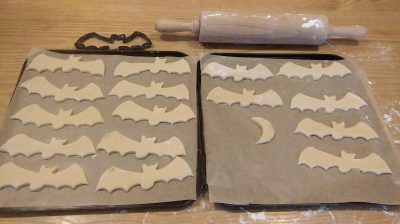 Dip your bat cutter into flour and start cutting out shapes. 12. An egg slice may be useful to lift the biscuits onto the greaseproof lined baking sheets. Place the biscuits spaced a little apart on the baking sheet. 13. 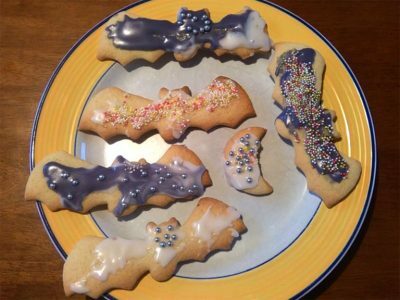 You could also make crescent moon or full moon shapes by carefully using an upturned glass or cup as a cookie cutter. 14. Bake for 8-12 minutes. The biscuits are cooked when they are slightly golden around the edges. Cool on a rack. 15. 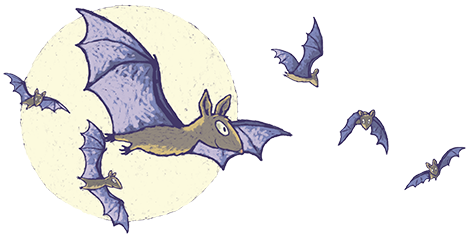 Decorate them once they have cooled using tubes of icing, or dissolve a small amount of hot water into the 150g icing sugar, add colours as desired and spread on the bats. These biscuits store well in a sealed container for several days.